First, Happy Thanksgiving to all! Now, let’s go fishing! Tuesday, 11/11/14, I fished 19 miles west of New Pass with brothers, Mike and Pat Connealy. We had steady action, and the guys used live shrimp to catch and release lots of red grouper to 24 inches, many of which would have been keepers, had red grouper been in season. Mike also caught a nice triggerfish at 14 inches, which is also currently out of season and had to be released. But the guys only needed enough fish for dinner, and they had plenty of 13-inch grunts and 14-inch whitebone porgies boxed for that. Another pair of brothers fished with me on Wednesday, 11/12: Brian and Gary Lampner headed 25 miles offshore with me, hoping for grouper and snapper action. We did well with both. With gag grouper still in season, the guys were happy to land a 29-inch, nearly 12-pound gag. They caught and released twenty-five out-of-season red grouper to 25 inches, along with ten out-of-season triggerfish to 16 inches, also released. In addition to the gag, the guys boxed fifteen whitebone porgies in the 14-15-inch range, a half dozen 14-inch grunts, and a half dozen keeper lane snapper. They released shorter lanes and some yellowtail snapper shorts. The gag grouper and the 25-inch red grouper both bit on spot tail grunts, while everything else bit live shrimp. Dave Mercer and father-in-law, Rod Knudsen, fished a catch-and-release, inshore trip in lower Hickory Bay with me on Thursday morning, 11/13, using live shrimp for bait. The guys released twenty-five sheepshead to 13 inches, a 19-inch snook, a couple of puffer fish, a couple of 2-pound sail cats, and a nice 26 ½-inch redfish. Gerry and June Loftus and friends, Jim and Connie, fished lower Hickory Bay with me on Friday morning, 11/14, after we ruled out fishing offshore due to rough seas of three-to-five feet. Conditions were a lot different in the backwaters than they had been the previous day, with a windy front having come through, and extreme low tides. It was tough going, but the group caught a couple of keeper mangrove snapper and sheepshead, on shrimp. They released smaller sheepshead and a couple of sail cats. As the folks all over the country to our north endured a bone-shilling arctic blast, our weekend here brought wind and rising seas, with small craft advisories following on Monday. Tuesday was a blustery, rainy day, culminating in low temps into the 40's overnight, with a chilly, windy Wednesday to follow. I remained in port, hoping for seas to calm in time for my next scheduled trip at week's end. Thursday, 11/20 was still blustery, with high seas, as had been the case all week, and my planned offshore trip canceled. Friday morning, 11/21, was drizzly and windy, but Dave and Diane Carey and son, Dan, who had hoped to fish offshore, traded those plans for a calm, inshore trip in lower Hickory Bay, where the family used live shrimp to catch and release three redfish to 17 3/4 inches and five sheepshead shorts. They boxed a 15 1/2-inch sheepshead and a 21-inch black drum. Darren and Linda Rachman and Linda’s mom, Paula, fished inshore with me on a very windy Saturday morning, 11/22, using live shrimp to lure three keeper sheepshead to 14 inches and a 16 ½-inch black drum into the fish cooler The trio released several smaller sheepshead. 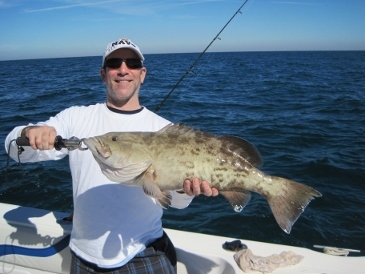 The photo shown is of angler Gary Lampner, with a 12-pound, 29-inch gag grouper, caught on a spot-tail grunt and released (due to closed season) on a recent offshore trip. You can check out all of our shark and goliath grouper action videos at the following link.